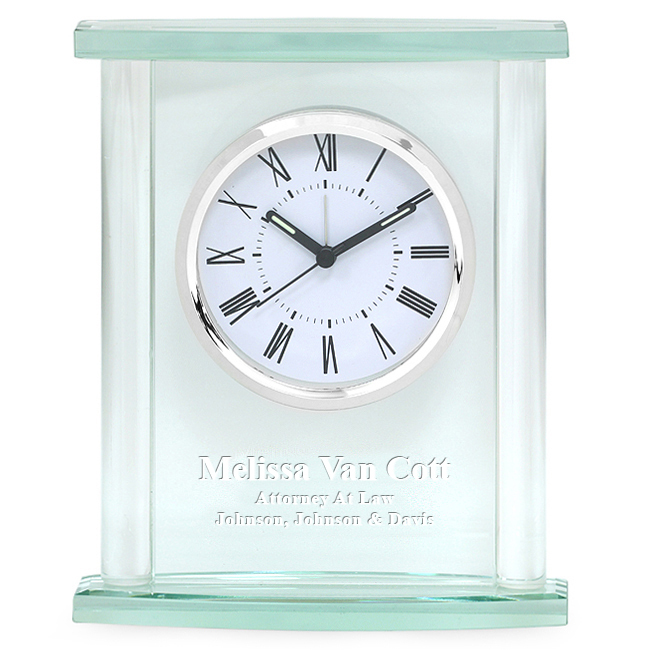 FEATURES/SPECS Crystal goes with any desktop and any decor and this solid crystal desk clock is no exception. It has a thick glass top and base along with crystal piping on both sides. The body is made of solid glass too and it holds a round quartz clock. The white dial clock is framed by a polished silver bezel and has black numerals, black hour, minute & second hands and a silver alarm hand. 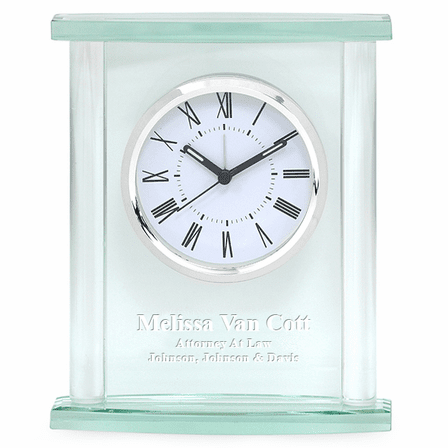 Add a laser engraved inscription centered in the area between the clock and the base free of charge. 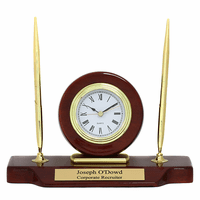 This personalized crystal desk clock will become a cherished keepsake for a valuable employee or deserving coworker. 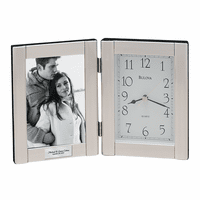 Dimensions: 7" x 5 3/4"
I am interested in purchasing several clocks with our logo engraved on it. Is there any quantity discount? We do have discounts available. If your order is over $200, use coupon code EGS105 to receive a 5% discount. If it is over $500, use coupon code EGS110 to receive a 10% discount. Engraving and shipping are free of charge as well. My husband and I decided to give this clock to our nephew as a commemorative gift when he earned his doctoral degree in education. I called Executive Gift Shoppe to get some guidance on the engraving and Pete was very helpful. The company does excellent engraving, ships quickly, and they stand behind their work. We will definitely order from Executive Gift Shoppe again when the need arises and would recommend them to anyone looking for an engravable gift. Elegant clock for a good price. This clock looks like other clocks that sell for a much bigger price. Customer service was great; very quick and helpful. This was a perfect retirement gift for an employee. I hope the clock itself is quality and works for a long time. We have many employees due to retire soon, and this will be our go-to gift. Thanks! We ordered 9 of these engraved clocks. They were lovely and met our needs perfectly. I never had a chance to test out the clocks since they were gifts but all the recipients seemed to have loved them. Proslovely and fit our needs as a graduation gift. Cheaper that most engraving places we looked at or had used and yet they were the same item or at least seemed to have been. Engraving was clear and easy to read. This company is a pleasure to deal with. Quality merchandise and competent, helpful employees. I would greatly recommend them. Nice, but doesn't feel like glass. These clocks look great! But while they look like glass, they don't feel like glass. Feels more plastic to me. Personalization was perfect. Shipping was extremely fast!